HH and the Boys: Easy Like Sunday...plus toys!!! 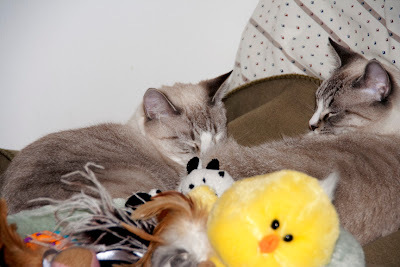 Today, the boys are engaging in the usual easy like Sunday behavior, but when they wake up... they have a pile of toys ready for their attention. HH finished her cleaning and then piled up all the toys to surprise the boys. They will be thrilled to see all their old friends that got lost here and there in the condo. Have a great Sunday everybody and remember... Max Loves Ya!! Those boys are going to be thrilled when they wake up! Those boys are so adorable. I don't think they have enough toys tho - they are deprived kitties just like me. Like Christmas in July! Without the wrapping. Oh what fun you boys are going to have with all your toys. Can you send HH here to help the Momster get her cleaning done too? And then pile all our toys just like that for us? We see 2 cats that are gonna have some fun today!! And we love you Max, and Bugsy, and Knuckles, and your HH. YAY that missing toys have been found.....we are sure Bugsy and Knuckles will put them to good use later today. That's the best part of cleaning - finding old friends!!! That sure makes for one fun Easy Sunday boys! It's amazing how those toys can get lost like that! Looks like some fun is ahead! Waking up to all those toys will be like a dream come true! Sleepin wif your toys is great! Princess always takes a toy to bed wif her! Purrs. It's gonna be like Sandy Claws came when those lazy boys finally wake up! Heh. My human never does anything like that for me. I am calling her over to read your post now! OoH what fun dey will have when dey wakes up! The boys will have fun, till they hide them all again!